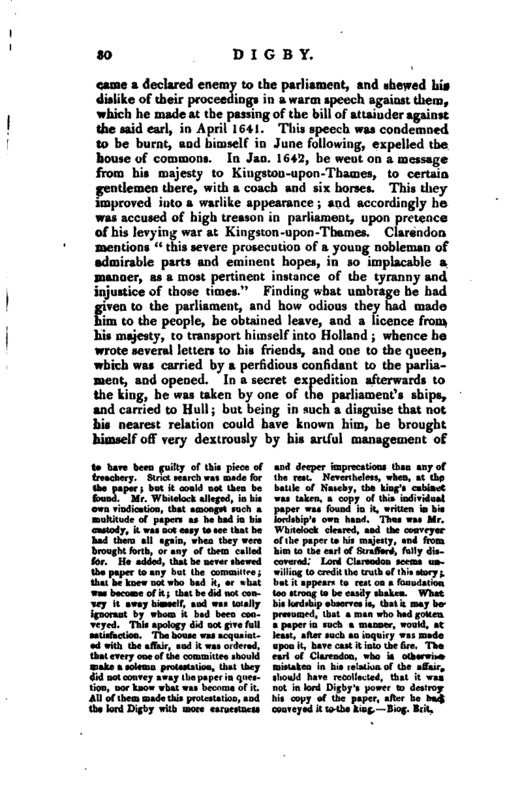 The story is thus told He pretended to be a Frenchman, the language of which country he spoke excellently; and he appealed to be so sea-sick, that he kept himsult in the hole of the bark, till it arrived at the landing-place: and in that time he disposed of such papers as were not fit to be perused. When he came on shore, he so well counterfeited sickness and want of health, that he obtained leave to be sent, under a guard, to some obscure corner, for repose. In this confinement he began seriously to reflect on the desperateness of his condition. He did not think it possible for him to continue long concealed; and, if he should be discovered, he knew that he was so odious, above all other men, to the parliament, that his life would be in the greatest danger. At the same time, he was sensible that sir John Hotham, the governor of Hull, was his enemy, and that he was a man of a covetous, rough, and unfeeling disposition. Nevertheless, he resolved to discover himself to him. 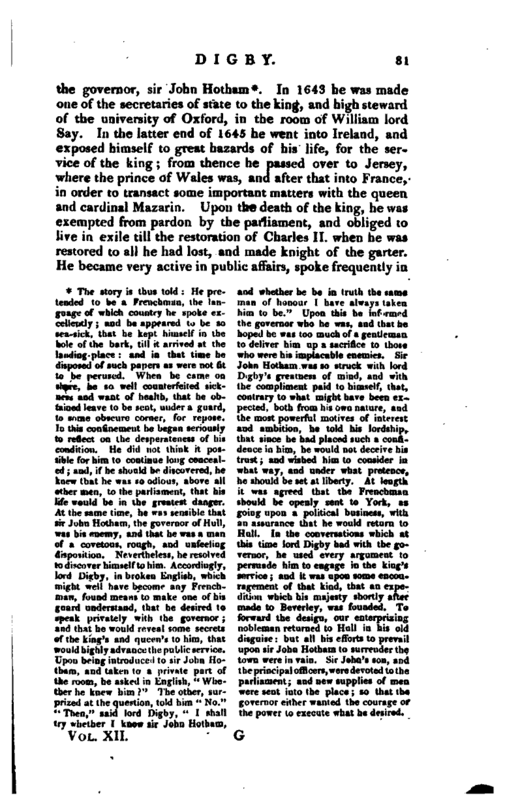 Accordingly, lord Digby, in broken English, which might well have become any Frenchman, found means to make one of his guard understand, tbat he desired to apeak privately with the governor; and that he would reveal some secrets f the king’s and queen’s to him, that would highly advance the public service. Upon being introduced to sir John Hotham, and taken to a private part of the room, he asked in English, “Whether he knew him?” The other, surprized at the question, told him “No.” “Then,” said lord Bigby, “I shall try whether I know sir John Hotham, and whether he be in truth the same man of honour I have always taken him to be.” Upon this he informed the governor who he was, and that he hoped he was too much of a gentleman to deliver him up a sacrifice t/i those who were his implacable enemies. 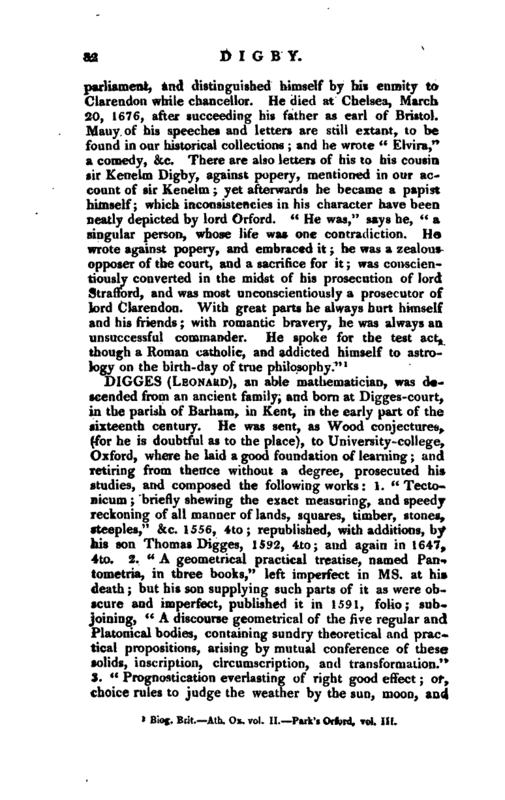 Sir John Hotham was so struck with lord Digby’s greatness of mind, and with, the compliment paid to him<elf, that, contrary to what might have been expected, both from his own nature, and the most powerful motives of interest and ambition, he told his lordship, that since he had placed such a confidence in him, he would not deceive hi* trust; and wished him to consider in what way, and under what pretence, he should be set at liberty. At length it was agreed that the Frenchman should be openly sent te York, as going upon a political business, with an assurance that he would return to Hull. 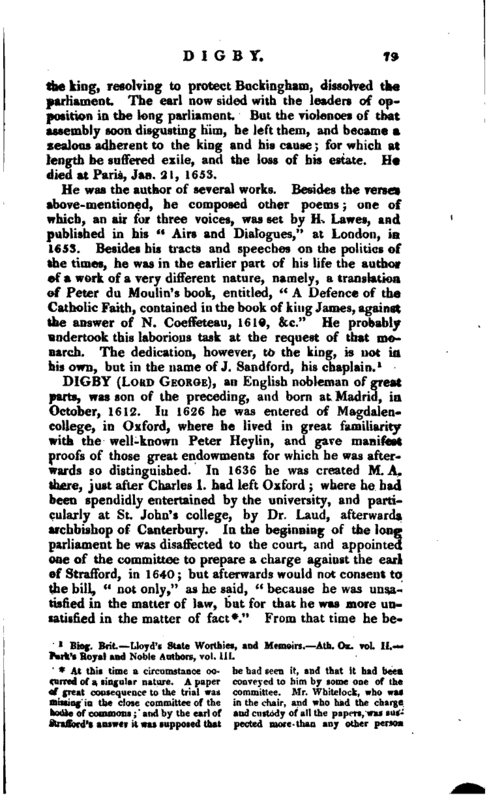 In the conversations which at this time lord Digby had with the governor, he used every argument to persuade him to engage in the king’s service; and it was upon some encouragement of that kind, that an expedition which his majesty shortly after made to Beverley, was founded. T forward the design, our enterprizing nobleman returned to Hull in his old disguise: but all his efforts to prevail upon sir John Hotham to surrender the town were in vain. Sir John’s son, and the principal officers, were devoted to the parliament; and new supplies of men were sent into the place; so that the governor either wanted the courage or the power to execute what be desired.